One of my coworkers asked me if I was paying homage to Snoop Dogg with my 'all blue Chucks'. I stared blankly, I had no idea. So I looked it up, the song is Lodi Dodi, and I borrowed the title from it. I don't really care for much rap, but I can appreciate this particular verse. I finished up June with my last Lucky inspired look. Unlike Lucky suggests, I don't think that a white sneaker is ideal, even a white converse. For me, a white sneaker with a skirt makes you look like one of the women who commute to office jobs and wear sneakers on the street with their sensible heels tucked away in a shopping bag. Most of those women wear very athletic white sneakers, and I think they just look so silly. 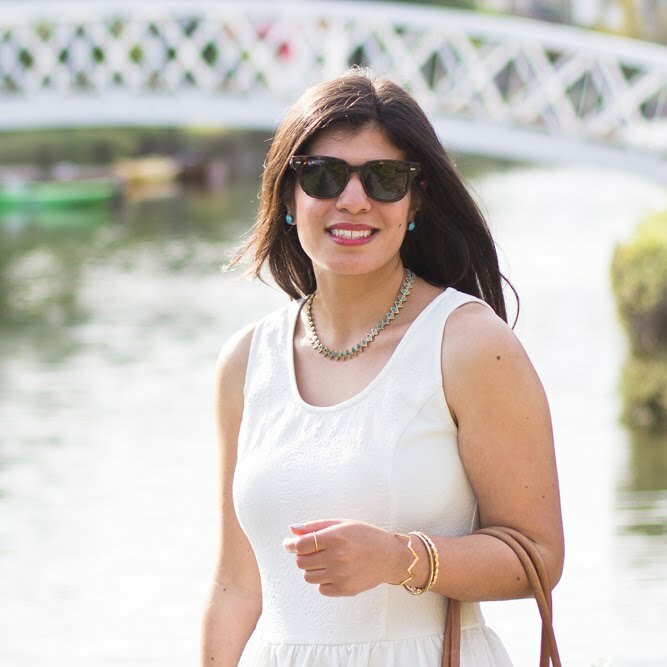 White sneakers could work with trousers, or shorts or jeans, of course, but not a skirt. Cream, I think I could wear with a skirt however. I should put cream converse on my list. 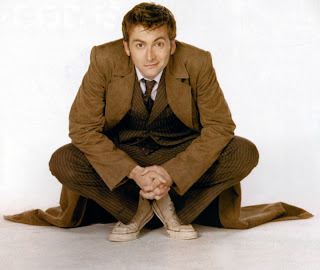 Cream Chucks make me think of the Tenth Doctor on Doctor Who. I loved him so much. And I pretty much attribute my interest in Converse in the first place to him. Before that, the only person I knew with them was my good friend Abbey, who rocked middle school in a pair of bright red high tops. Look how cute! I'm going to be good and only put one photo (you know I secretly want to put 20) of the gorgeous David Tennant and his Chucks - they were in fact, his. Another part of Lucky's look I had issues with was the wide striped shirt. Not the stripes themselves, but the actual shirt. Horizontal stripes + wideness = extreme wideness. Sure, the model looks okay, but I didn't think there was enough balance in that look for me. I realized after wearing this, that a skirt with sneakers was not a look I hadn't yet tried. I did it in Italy. Twice. And I think my blue skirt with the floral cardi and black converse is way cuter than Lucky's suggestion. Choose a short, full mini skirt. You need a lot of leg to work with a flat shoe, and anything like a pencil skirt would make it look like you were running to the office. Keep the top close fitting to balance out the fullness of the skirt. Make sure your sneaker is non-athletic and looks deliberate. No one should think your cute shoes got stolen at a party and this all the hostess could supply you with. Oh hey, this is my 200th post. Cool. "Make sure your sneaker is non-athletic and looks deliberate. No one should think your cute shoes got stolen at a party and this all the hostess could supply you with." I agree with the above. Your version is cuter! 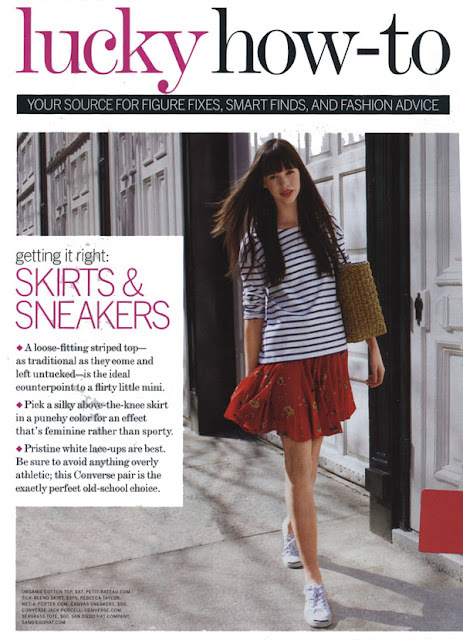 I'm not a big fan of converse myself, but sneakers and skirts can be oh-so-cool and casual. I like your Italy look better too. I find the Lucky look was too bland. The Italy one looks more you, more personality! I 'm also feeling the idea of cream Chuck Taylors - ya! yeah, I never get that david tennant thing. He's nice, and funny, and Scottish in the best possible way, yeah, but gorgeous? hmmm. I go back and forth with cons and skirts too. I have a pair of white ones (that I bought when I was required to have white shoes for a hospital job, so I said alright I'm going to go all Grey's Anatomy on you) but the problem is my feet look huge in all cons. I love your blue ones in this post, they pop! Lol! Too funny! Your look is awesome! Mind if I borrow the skirt :) Cute dog!! I love the trainers with skirts looks. I have my mum's Keds from the 90s. They're borderline hideous, but I LOVE THEM. You rock both your looks! But I REALLY like the first one -- stripes + florals = SUCH A WIN. wow, you look stunning in both looks! but i think the last one looks cuter ;) thanks for sharing the tip! Nautical tops are my favorite and this one on you is perfect! And the accessory of the pup - well the best accessory =) Enjoy your weekend. I love both of your skirt/Chucks combos, especially the one with the flowered top. I always want to make this work and end up chickening out at the last minute. Congrats on your 200th post! Great outfit. Love those blue chucks! Love both looks, and your skirt with the red flowers is just amazing:) Oh, and the dog is super-cute! i loved this lucky look also--you've pulled it off so well!